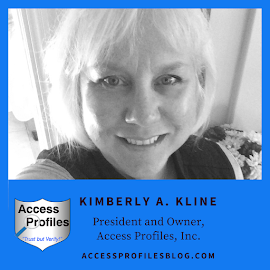 Access Profiles, Inc.: The Top 6 People You Should Run a Background Check On! 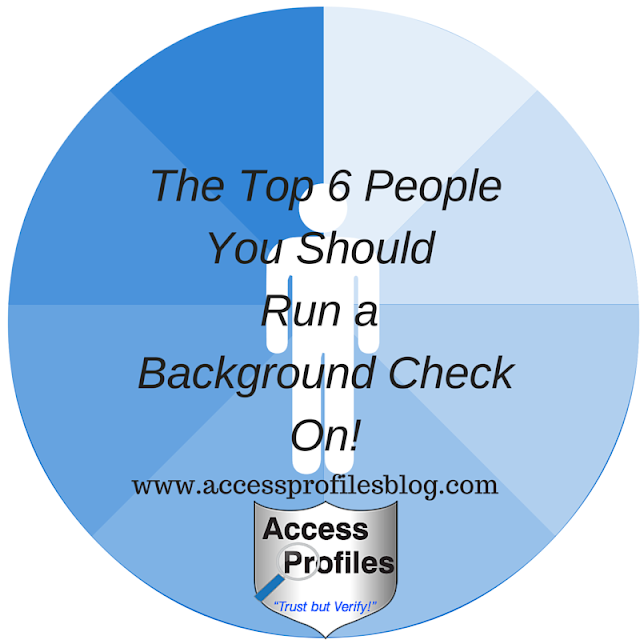 The Top 6 People You Should Run a Background Check On! Many of us will, at one time or another, need to hire someone. Whether it is to help care for our children or an elderly parent, or even to complete our home improvement projects. Either way, it is important that your family's safety comes first. This is where a good Background Check comes in! Background Checks are designed for protection. Knowing all you can before you hire anyone that comes in contact with your family or your home makes sense. That is where a good Background Check comes in! 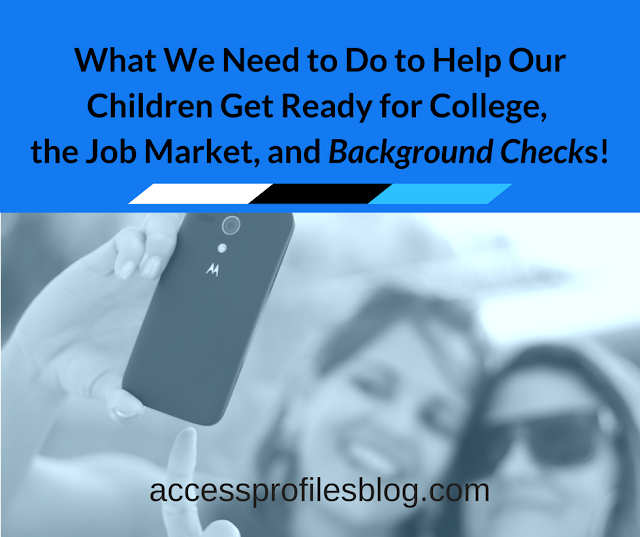 6 People You Should Always Run a Background Check On! "Tweet This"! sure that the person you hire to watch them when you are not around is safe and reliable makes sense. You can check with previous employers for a good part of the information you need. Many teens also take a Red Cross Course in babysitting and you can ask if they have this certification. If you are hiring a nanny through an agency, verify that they have run a criminal background check and ask for the results! You should also see that they have been certified in basic first aid and child CPR. If you have elderly parents or anyone in need of a home health aide, knowing that those people have the certifications and training they need is crucial. Making sure they do not have any criminal record (especially anything to do with abuse or drug offenses) is also essential to the protection of those you love. The agency providing the health care worker should have run a background check containing this information. Make sure you know what they found before you allow them in your home. Do you really want the people that clean your home unsupervised to have a criminal record? At the very least you want to know what kind of job they do and if they are reliable. Check their references carefully and, if they are employed through an agency, check to see what you can expect in the event of any problems with the service. Checking references of past customers may give you information on their skills and work habits. If they own their own business, checking with the Better Business Bureau or your local township offices for complaints and how they resolved them is good business. While getting a new roommate rarely escalates into an incident like the one depicted in the movie “Single White Female”, checking out a potential new roommate is both practical and sensible. Do they have a criminal record? Do they pay their rent on time? You may not be able to access their financial records, but contacting their previous landlords or roommates is a good step. You can also check your county’s civil and federal court records to see if they have filed bankruptcy or been involved in litigations. Do you own any rental property? A vacation home you are thinking of renting? You need to take the necessary steps to protect both your property and ensuring the safety of your other tenants (if you have them) and your neighbors. A basic check of any criminal or civil actions against them is the first step. You should also check any past landlords to determine whether they pay their rent on time and if they left the rental property in good order. the additional peace of mind you will have is invaluable. Check out these tips on hiring the best Background Check company for You, Here! Please "Pay it Forward" and Share! Thanks! We can help You Hire Safely and Effectively! Check out our "About" and "Services" pages while you are there to find out more about What We Do!